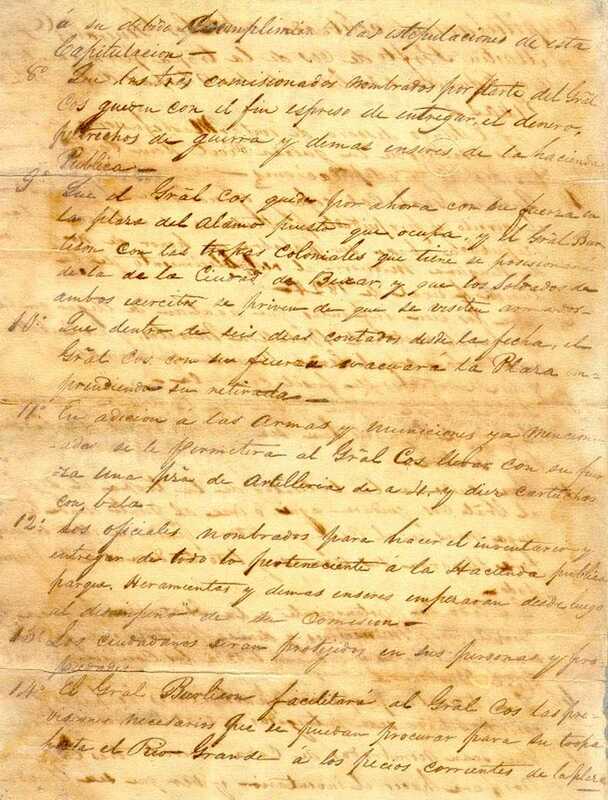 Capitulation entered into by general Martin Perfecto de Cos, of the Permanent troops, and general Edward Burleson, of the Colonial troops of Texas. 1st. 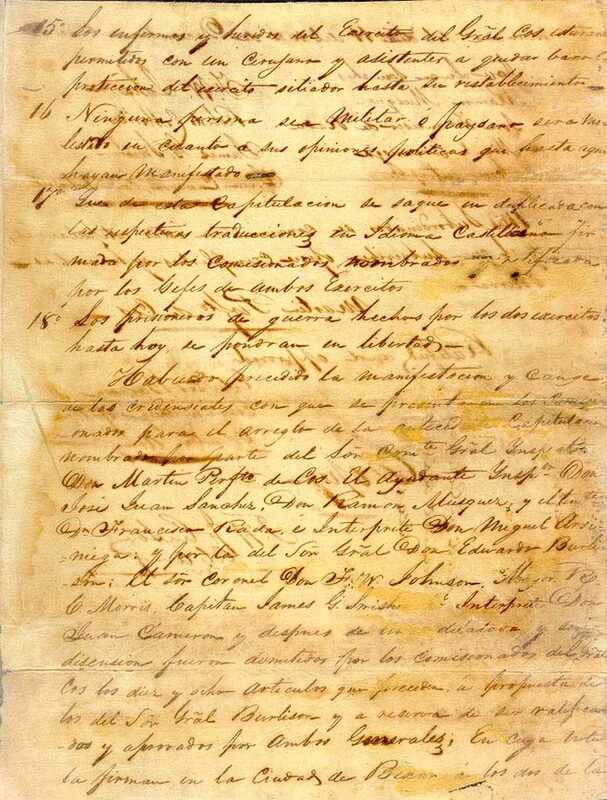 That general Cos and his officers retire into the interior of the republic, under parole of honor; that they will not in any way oppose the re-establishment of the federal Constitution of 1824. 2d. That the one hundred infantry lately arrived with the convicts, the remnant of the battalion of Morelos, and the cavalry, retire with the general; taking their arms and ten rounds of cartridges for their muskets. 3d. That the general take the convicts brought in by colonel Ugartechea, beyond the Rio Grande. 4th. That it is discretionary with the troops to follow their general, remain, or go to such point as they may deem proper: but in case they should all or any of them separate, they are to have their arms, &c.
5th. That all the public property, money, arms and munitions of war, be inventoried and delivered to general Burleson. 6th. That all private property be restored to its proper owners. and see that the terms of the capitulation be carried into effect. 8th. That three officers on the part of general Cos remain for the purpose of delivering over the said property, stores, &c.
9th. That general Cos with his force, for the present, occupy the Alamo; and general Burleson, with his force, occupy the town of Bejar; and that the soldiers of neither party pass to the other, armed. 10th. General Cos shall, within six days from the date hereof, remove his force from the garrison he now occupies. 11th. In addition to the arms before mentioned, general Cos shall be permitted to take with his force, a four-pounder, and ten rounds of powder and ball. 12th. The officers appointed to make the inventory and delivery of the stores, &c. shall enter upon the duties to which they have been appointed, forthwith. 13th. The citizens shall be protected in their persons and property. 14th. 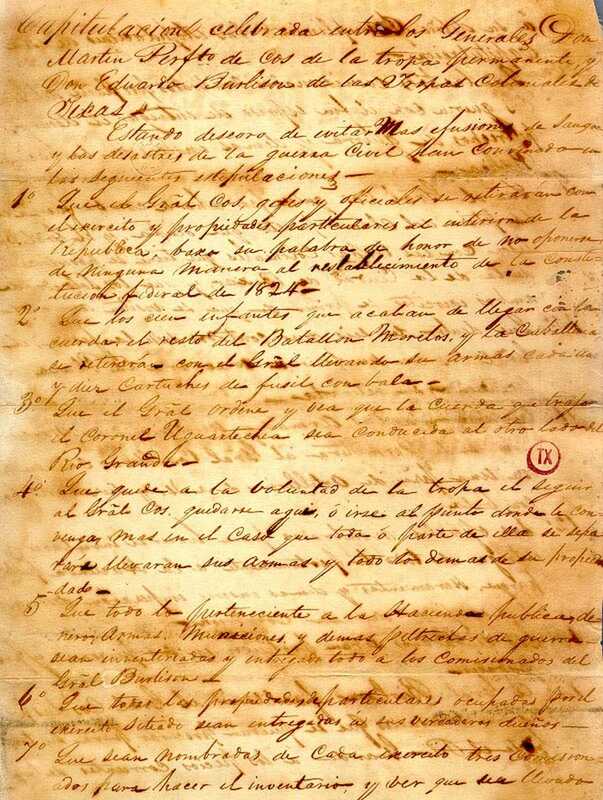 General Burleson will furnish general Cos with such provisions as can be obtained, necessary for his troops to the Rio Grande, at the ordinary price of the country. 15th. The sick and wounded of general Cos’s army, together with a surgeon and attendants, are permitted to remain. 16th. No person, either citizen or soldier, to be molested on account of his political opinions hitherto expressed. 17th. That duplicates of this capitulation be made out in Castilian and English, and signed by the commissioners appointed, and ratified by the commanders of both armies. 18th. The prisoners of both armies, up to this day, shall be put at liberty. 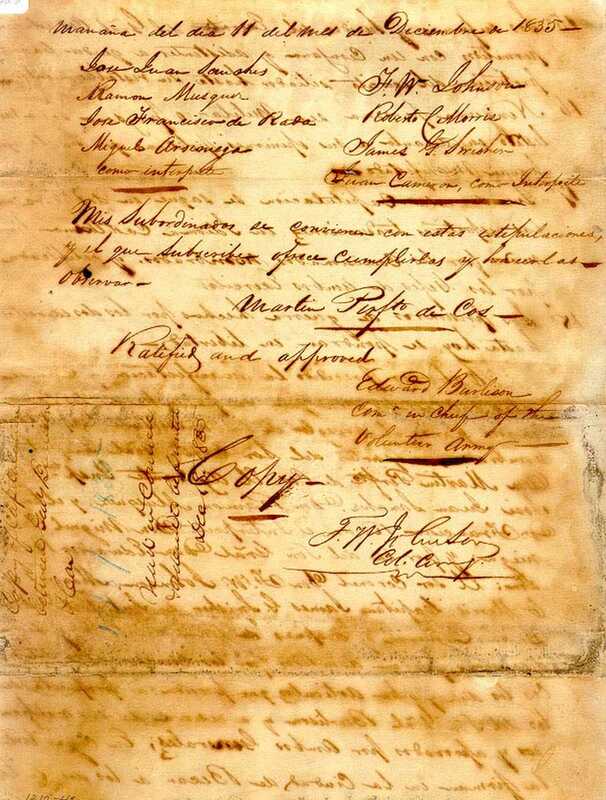 The commissioners, Jose Juan Sanchez, adjutant inspector; Don Ramon Musquiz, and lieutenant Francisco Rada, and interpreter, Don Miguel Arciniega; appointed by the commandant and inspector, general Martin Perfecto de Cos, in connection with colonel F. W. Johnson, major R. C. Morris, and captain J. G. Swisher, and interpreter John Cameron; appointed on the part of general Edward Burleson: after a long and serious discussion, adopted the eighteen preceding articles were accepted by the Commissioners of Señor General Cos, at the proposal of the Commissioners of Señor General Burlison while reserving their ratification by the generals of both armies. morning of the 11th of December, 1835. I consent to, and will observe the above articles. Edward Burleson Commander-in-chief of the Volunteer Army. (Editor’s note: the sections of the text in green italic in Article 18 represent portions omitted from the transcription and translation of the original treaty.